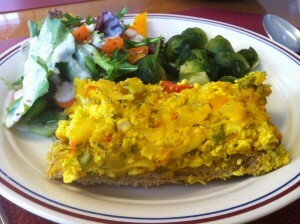 I got this tofu quiche recipe idea from Mrs. Marlene Mckinney. I had her mini crustless tofu quiches when I visited her house about 2 years or so ago. She’s an excellent cook, and her vegan cooking has appeared on 3ABN television. Everyone who ate my tofu quiche liked it, so that gives me more confidence to share this Wal-mart (or local grocery store) friendly recipe idea. Yes, I did buy a crust from Wal-mart to make a vegan pizza, but I’m starting to make my own crust because I want to expand my skills, and I also want to ensure I’m eating the most wholesome ingredients on a regular basis. The Rustic crust that I bought was made from enriched wheat, which isn’t the best, but I probably still will buy it on occasion. I can make pizzas from whole wheat pita bread, but I needed to make a crust and a topping that could feed at least four people. 2 1/2 C. WW Flour. Combine and mix ingredients in a bowl. Knead it for a few minutes, and let the crust rise for 30 minutes. I personally will put a towel over it and let it rise in a warm place. Then roll out the crust VERY thinly on a sprayed cookie sheet, poke many holes in it with a knife, and let it cook in the oven for 12-15 minutes. By the way, I found whole wheat and white whole wheat flour at Wal-mart. I mixed both of them together half and half, and my quiche crust recipe came out better this time. Because this recipe is more time consuming and I want the yeast to die, I make my crust at least one or two days in advance. Mix ingredients together and then place on your premade quiche crust. Preheat the oven to 375F and bake for about 30-40 minutes. Eat and enjoy! Want to learn more about health? OpenSourceVegan.com highly recommends you read the book, The Ministry of Healing! Sounds good, Franklin! I’ll be sure to give it a try. Great Ani! When I posted it last night, I forgot to add that I used two cups of chopped celery. Also, I used a liberal amount of onion powder. When I do this recipe again, I need to do exact amounts. Also, four people were able to finish this quiche in two days, so it was relatively big. When also had other items to eat as you can see on my plate. Please tell me how it goes after you make it. 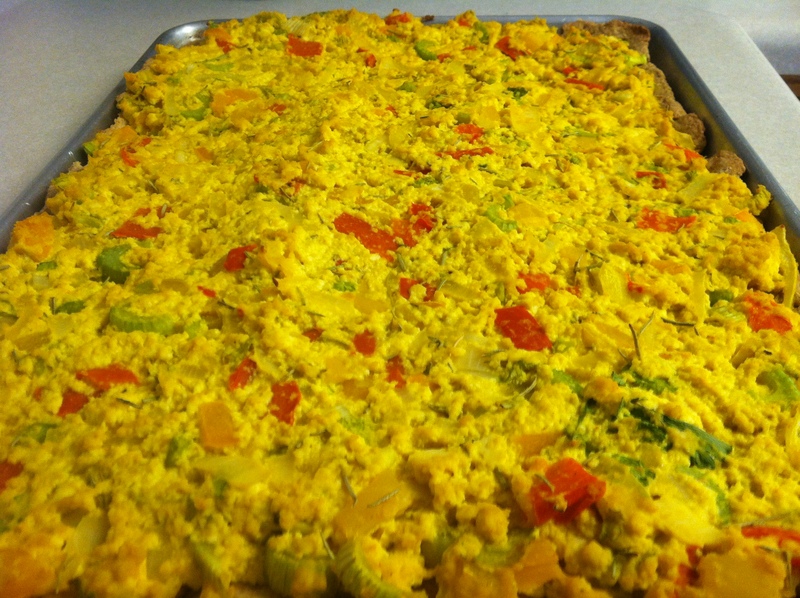 I just posted a video on this link of how I make the quiche. I also now give exact crust measurements to go with the filling. Thank you for making the video of this. I am very motivated to try cooking this!